Albert Lowe wrote such a useful comment on Andrea’s DIT article on How to Research a Slumlord, that I turned it into a post here. Thanks, Albert! I have a couple of other suggestions about acquiring public data. Any researcher should familiarize him/herself with the public records and their offices. You may have the right to access public records, but let’s make it as easy as possible. Try visiting public offices (land records, tax records, planning records, court records, and housing inspection records are all maintained locally). Find out the staff’s day-to-day practices. They have to deal with jerks and entitled developers all of the time. Just being friendly, respectful and possibly flirty may go a long way before you threaten anyone with a lawsuit for denying you information. Second, databases like Lexis-Nexis or Westlaw are great because you can do that research anytime of day as long as you’re in front of a computer. However, the mortgage record or grant deed in Lexis-Nexis only has limited information (grantor, grantee, address, parcel number, may or may not include grantee business address). 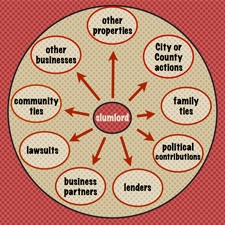 If you spend the extra time going to land records, you may find leases, other agreements, names of business partners, strange conditions of land transfer. What is a one page summary on Lexis-Nexis may be a 100-page document in land records. Also, with court records, the plaintiff-defendant names are the most common search terms but it is the documents inside the dockets that contains the juicy material. Once you find the interesting cases in the third party databases, go to the court house and look-up the case number. If you’re not a lawyer, the documents may seem really “jargony.” I recommend looking for swore testimonies, and “motion for summary judgment.” Unlike a “complaint” that can make the most egregious assertions (and complaints should NOT be quoted unless consulted with legal professionals), if the court file contains a “motion for summary judgment” – that document contains a summary with evidence on why the court should dismiss the case. Main moral – be thorough in your research and get out of the office!